The beautiful and spacious outdoor space that is shared by the Dream and Hope Rooms is an amazing natural environment which encompasses and extends our play-based curriculum. Our yard comprises of natural play spaces and equipment that are age appropriate and suited to the ages of the children in our rooms. 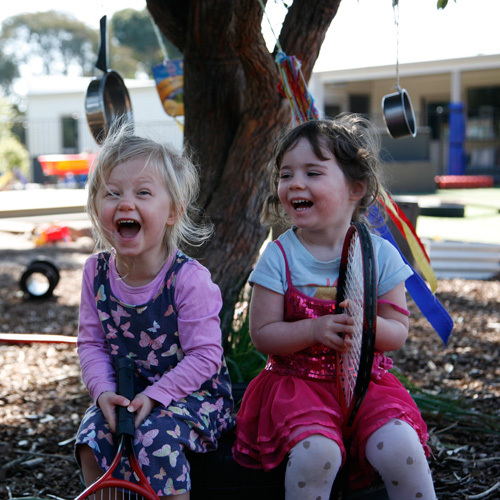 This ensures that all children, regardless of their capabilities, are able to experience and enjoy their time outside. We believe that time spent in a natural environment encourages children to initiate and direct their own play, ensuring each child is given the opportunity to express themselves and be involved in decisions that affect the world around them. This supports each child to understand and develop their own agency, which is an important factor in the holistic development of each child. 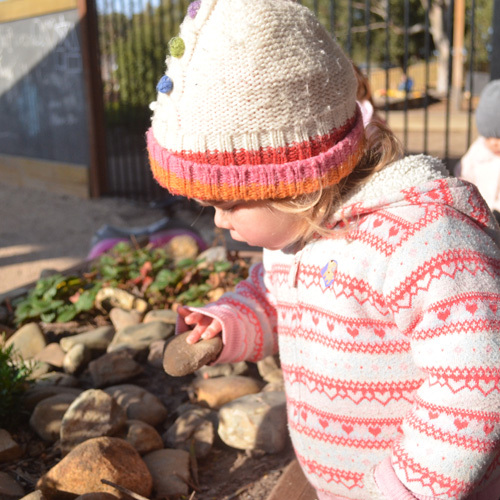 Within our outdoor space, educators encourage the children to explore and investigate different natural elements of their environment, both living and non-living, through their senses. This is further promoted through different types of experiences such as water play, sand play and mud play. Our yard is interspersed with garden beds and a wide variety of plants. These garden beds are updated and refreshed seasonally to introduce the children to the concept of lifecycles and sustainability. 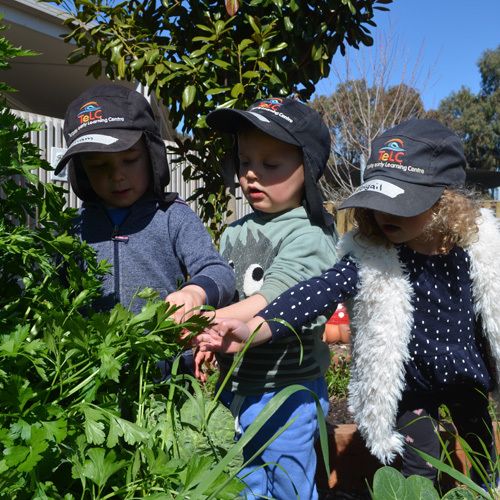 The educators encourage children to participate in the planting and nurturing of the gardens, emphasising and encouraging a sense of community and interconnectedness. 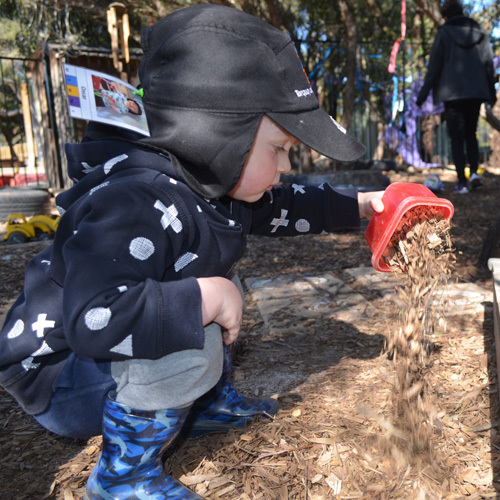 The children are also supported and encouraged by our educators to use the naturally occurring resources in our yard such as stones, sticks, gum nuts, leaves, dirt, water, and flowers during their imaginative play experiences. This enhances each child’s connection to nature, and their understanding of the world around them and their place within that world. The configuration of the play equipment in our outdoor area is an important consideration within our programming and planning cycle. This ensures development of the children’s fine and gross motor skills and assists in the strengthening of core muscles by offering climbing and crawling opportunities. Our yard is a challenging environment that promotes risk-taking, whilst remaining a safe, familiar, and inspiring space that embraces each individual child. The Dream and Hope Rooms’ outdoor area not only promotes a child’s need for moments of solitude by providing access to spaces such as a cubby house, and outdoor art area, but also provides areas for engaging in shared group experiences. Our indoor and outdoor play spaces seamlessly flow together which provides our children with a natural connection between natural and built environments. As you step outside of the Toddler Rooms and into our outdoor space, you are surrounded by our unique natural habitat. Each child has the opportunity to immerse themselves in the sights, sounds, textures, tastes, and smells of nature, and to use these experiences to broaden their knowledge and understanding of the world in which they live and to develop a respect for both natural and built environments. 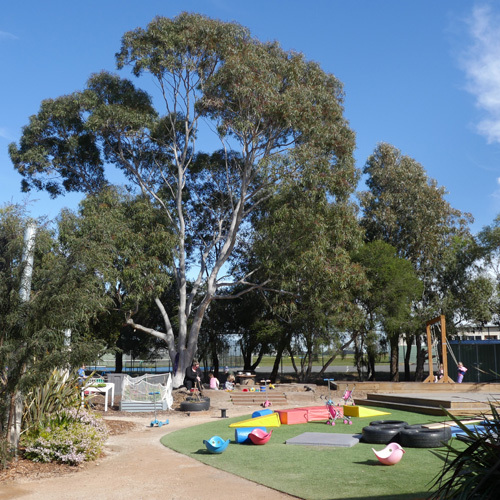 The Toddler yard encompasses built areas such as sandpits, dirt pits, garden beds, climbing frames, cubby, fairy garden, swings and a slide which are seamlessly connected to the more natural landscape of trees, shrubs, and lawn. The children are encouraged to not only ‘play’ in these areas, but to explore all the different levels and aspects of this natural environment. Through role-modelling and open-ended questions, educators inspire the children to explore, investigate, and observe the interdependence between land, people, plants and animals. The children are given the opportunity to dig, build, bury, touch, smell, embrace, listen, discuss, imagine, drive, ride, balance, climb, swing, and thoroughly embrace the world around them whilst recognising their unique place within this world. The Toddler Rooms’ outdoor space also caters for those children who prefer to spend their time outside in less physical activities. We have small, quiet play spaces such as the cubby for imaginative play times, an outdoor art activity area and a big comfortable couch for reading and story-telling on the shaded deck, and many trees and shrubs to hide in and around to dream, wonder, and imagine. The educators at TeLC are aware of the importance of children enjoying moments of solitude, and actively encourage and facilitate this within the outdoor space. Our outside area comprises a vegetable garden and composting bin which enables the children to develop an awareness of sustainability and the impact of human activity on our environment. The children participate in the planting, nurturing, and harvesting of a wide range of vegetables and herbs, which are then used by the children to cook delicious recipes. The Toddler Hub outdoor play area is a constantly evolving space which recognises and embraces the differing weather and seasons, the lifecycles of nature, and the changing interests of the children. This promotes children’s agency, supporting each child to make sense of their world and their place in it. Theories and research informed by the Reggio approach highlight the importance of the environment as the third teacher. 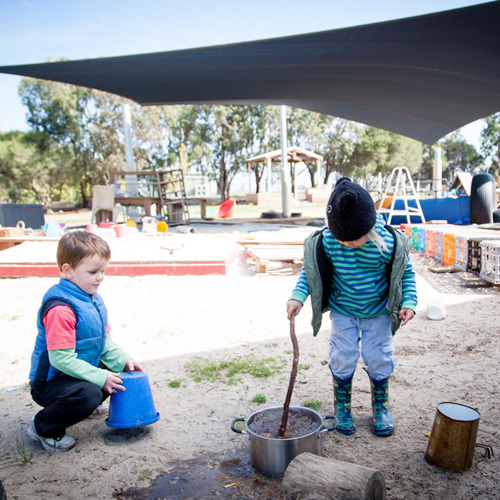 The outdoor spaces at TeLC allow children to delve deeper into their learning through exploration, risky play, problem solving and connecting with nature. Children have the opportunity to connect with nature through our expansive and natural settings. Children can feel the grass under their feet, hear the birds in the trees, observe the butterflies, bees and other insects, climb across the rocks, dig in the mud, jump in puddles, climb a tree. The benefits of connecting to nature are endless. Research around children who are provided with opportunities to connect with nature show an increase in confidence, motivation and concentration. Increased social and imaginative play. Motivation and concentration, increase language development and a greater respect of the natural environment. Educators guide and scaffold the children’s learning, building upon experiences and encouraging critical thinking and problem solving. The outdoor environment changes as the weather and seasons change, allowing the children to gain independence in learning to dress for weather changes, navigate wet rocks or slippery grass, notice changing trees, leaves, changes in bird behaviour e.g. watching birds collecting twigs for nests. The children are encouraged to care for and maintain the health and wellbeing of our animals in the yard such as our rabbit, guinea pigs and birds. Food scraps are used to feed our worms in the worm farm with the worm juice going back into our vegetable garden. Children are involved in the seasonal planting and harvesting of the garden beds and independently harvest the veggies and herbs for tasting. The connection with nature has allowed the children to further explore areas of interest and connect to the community, such as learning about bees. We now adopt a hive from Surfcoast Honey and have incursions with Tony the beekeeper who supplies us with local honey. Loose parts such as logs, rocks, sticks, sand and water allow for open-ended creating. Experiences are set up outdoors in a purposeful manner to extend on the children’s interests and areas of development. 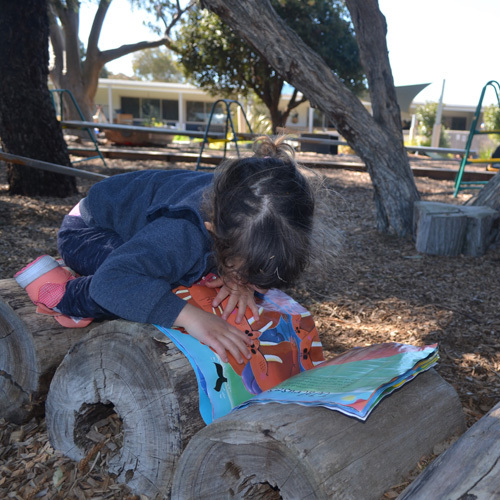 “Indoor” experiences are offered within the outdoor environment to provide a wide range of learning experiences such as drawing, painting, dolls and books. We often utilize the outdoor spaces to have lunch picnics, outdoor group times and whole group games. 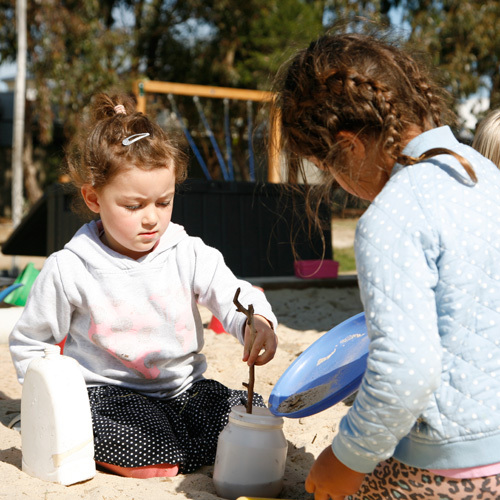 In the outdoor yard, we also have a large sandpit, sand area with climbing frames, cubby houses, mud kitchen and digging patch, swings, a large boat for imaginative play, bikes with a bike track and much more. Research shows children are spending more and more time indoors and more time watching screens than ever. This limits children’s chances to connect to nature. In response to these trends we are seeing a rise in health issues such as anxiety, obesity in children and a disconnect with nature. At TeLC we want to give children opportunities to spend quality time learning in the outdoors.